Now there is a ceramic Tardis stein mug that every Doctor Who fan that likes a good beer just needs to own. This Tardis stein is square and looks like the Tardis and yes there is a lid that is connected to the handle so that you can cover your drink when you take a break. The ceramic stein can hold 50oz of your favorite beverage and is approximately 9 inches tall. 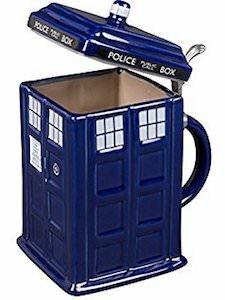 A mug like this is something every Doctor Who collection deserves and even if you don’t like to drink from it then you can still use it to store things inside.